Last June 7th, Sensation Yachts, a shipyard in New Zealand, launched "Maratani X", a 147-ft custom yacht built entirely of composite material and designed by Evan Marshall (interior and exterior) and Phil Curran (naval architecture). The outstanding features of this super-yacht are undoubtedly the materials used. In fact for boats of this size, steel and aluminium are usually preferred. Such feature goes with the sporty design, very slender at the prow and with a uniquely shaped stern area, where the designer created innovative connections between the various decks and the hard top. There are numerous windows, covering a large part of the superstructure and providing excellent light for the interior, which has been subdivided in an innovative way. The owner's suite, for example, is on the upper deck, behind the pilothouse and the master's cabin. It is roomy, has a sea view and a private terrace. The night area for the guests and crew, on the other hand, is divided between the main deck, where we find a large forward cabin with en-suite bath and private office, and the lower deck, where there are two single and two double cabins. The dining area, seating twelve, is on the main deck, which also has a saloon with a bar area and a separate cabin set up for multimedia entertainment. The sundeck has a closed-in saloon, open both forward and aft to provide access to the exterior areas, which are equipped with lounge chairs, cushioned sunning areas and Jacuzzi. To facilitate moving from one deck to another, the "Maratani X" has been equipped with a lift. She has very interesting performance, especially given her tonnage and general size, obtained thanks to the use of light, strong composite materials, to the racy waterlines and to the powerful Caterpillar motors. 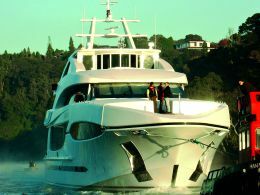 For further information: Sensation Yachts New Zealand, 11 Selwood Road, Henderson, P.O. Box 79-020, Royal Heights, Auckland, New Zealand; Tel. : (649) 8372210; Fax: (649) 8361775; Web site: www.sensation.co.nz; E-mail: sensation@sensation.co.nz. Classification: Det Norske Veritas Guide.